Collecting vaseline glass can be a minefield, with different definitions for what it is and what it isn’t. So, What exactly is antique vaseline glass. 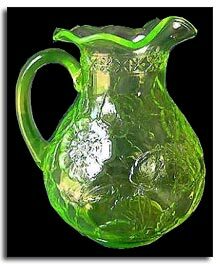 In 1835 experiments with uranium as a glass colourant were being carried out by Whitefriars Glass Works in London and in 1836 a pair of uranium glass candlesticks were presented to the Queen. Also in the 19th century, Davidsons glass produced a glass called pearline that contained uranium and was made with heat sensitive chemicals that turned milky white when reheated, producing a shading effect from yellow to milky white at the edges. Davidson’s lemon pearline is a good example of vaseline glass. 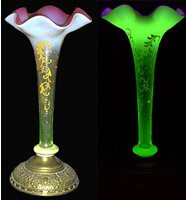 American collectors consider any kind of glass which glows under ultra-violet light because it contains uranium, as vaseline glass. 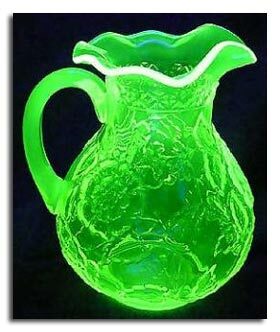 This glass can be green or yellow and the accepted vaseline glass definition by Vaseline Glass Collectors Inc, states it must contain uranium salts and be of a yellow/green hue and vaseline glass items should emit a green glow under a UV or Black Light. Vaseline Glass is a particular color of yellow-green glass that is made by adding 2% Uranium Dioxide to the ingredients when the glass formula is manufactured. The addition of the Uranium Dioxide makes the glass color yellow-green. Vaseline Glass is always verifiable by using an ultraviolet light (blacklight) on the glass item. When this is done, the glass turns a bright flourescent green. Sometimes, even the most trained eye can be fooled by a piece of glass that looks like Vaseline Glass, but will not glow or fluoresce bright green under a blacklight. Not all yellow-green glass will turn florescent GREEN when a UV light is shone on it. When manganese is added to the glass formula (which also makes a yellow-colored glass) instead of Uranium Dioxide, for instance, the end product will glow under a black light, but the color is an orange/peach color OR a lime green color that is much fainter than the bright neon green under UV light. Manganese is added to the glass mixture to counteract the minor traces of iron that would give the glass a coke-bottle greenish tint. Yellow to yellow-green glass that turns florescent bright green (under UV light) is the only true verification of Vaseline Glass. Antique Vaseline glass has become an important area for glass collectors. The range of makers, styles and age is diverse. Many of the current sources of vaseline glass are American glassmakers, with several of these still in production. In Europe the use of uranium was almost eliminated after WW2, with the exception of some Venetian glass on the island of Murano. More recently vaseline glass manufacture has been re-started by some Czech glass producers who often copy the styles and patterns of antique english glass makers. 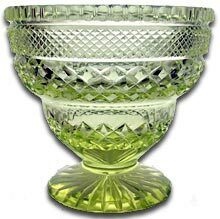 Some of the more notable English glassmakers to use uranium as a yellow/green colourant were Davidson, Greener, Sowerby and Burtles Tate. There have been claims that its first use was as early as 79 AD following the discovery in 1912 of a glass mosaic in the excavation on a Roman Villa near Naples in Italy but this was never proven. Other collectors consider it was first used by Josef Riedel at his Bohemian glassworks in the 1830’s. A gather was made of cranberry and then a larger gather of vaseline glass was made. Additives were also used to make it opalescent. The top was reheated to flare out the rim, and the opalescent layer gives the cranberry color some depth. Numerous pieces of this inner pink with a vaseline glass outer layer are known, in large brides baskets, little handled baskets, and in both clear and satin finishes. Speculation leans toward Thomas Webb as the maker but it could have been Stevens & Williams. 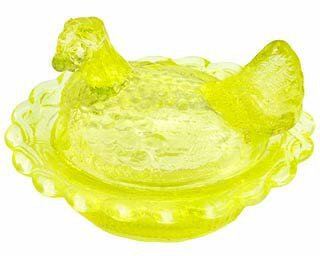 Manufactured from Vaseline Glass and formed in the shape of a hen on a nest. If you’re looking to add to your Vaseline glass collection, why not have a flick through our Vaseline Glass for sale section.